How often are you diagnosing patients with dental erosion? The latest ADA Clinical Evaluators (ACE) Panel report examines the prevalence of these diagnoses caused by extrinsic acids from diet and caused by intrinsic acids from gastroesophageal reflux disease (GERD), bulimia or alcoholism. Learn what differentiates these types of erosion and how to recognize them. 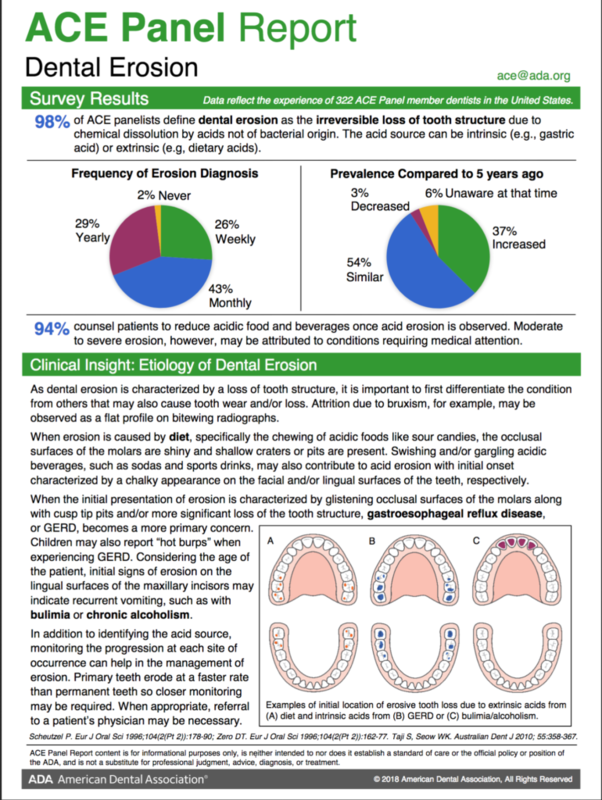 How often ADA dentists diagnose dental erosion in their patients. How this rate has changed in the past five years. Download the report today, and don’t forget to check out the archive of previous ACE Panel reports for more insights from your colleagues. The ACE Panel is a network of practicing ADA members who want to learn from one another by sharing clinical insights and experiences of dental products and materials. Expand your clinical knowledge and professional network by joining them! Learn more.